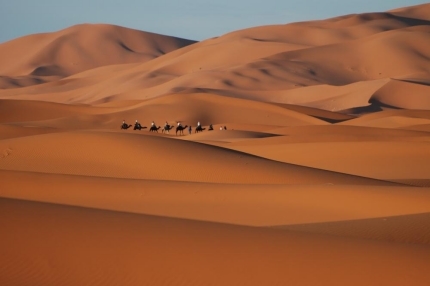 The Kingdom of Morocco is truly one of our most exotic destinations, with beautiful beaches on one end, high Atlas mountains, and the stark beauty of the Sahara to make the picture complete. Add to this equation, the remote villages, mud and clay architecture of the Kasbahs and boisterous markets of Marrakesh. Starting in Marrakesh, visit the souks, and try your hand at bargaining with the best! The introduction Morocco starts with the narrow laneways which wind their way through the magical city. We hike into the Atlas mountains following ancieant caravan toutes. Then off to the desert to discover the sand dunes with a cobalt blue sky in the background, fertile oases, all with mountains in the distance. Ride a camel, truck or hike to our destination at our campsite under the stars—a magnificent adventure.